1. Halve the garlic and remove the green ‘germ’ in the centre of each. Place the garlic into a pan with 120g milk and 5g of cold water. Bring slowly to a simmer over a low heat, then pour into a sieve and rinse the garlic under cold running water. Return the garlic to the pan and repeat this process three times. 2. Place the garlic with the remaining milk into a clean pan and simmer very gently over a low heat for 10-15 minutes until the garlic is very soft and the milk has reduced by three-quarters, or to about 100g. 3. Remove from the heat and pour into a blender. Add the breadcrumbs and anchovy fillets and blitz for 2 minutes. Add the egg yolks, mustard and vinegar, then continue to blend until well combined. With the motor running, slowly add the olive oil, then the grapeseed oil until fully emulsified. Season with the lemon juice and some salt to taste. Cover and chill until needed. 4. To make the relish, place the vinegar and 300g water in a pan over a medium heat. Add the diced beetroot and bring to a simmer. Cook for 5 minutes until the beetroot is tender. Remove and allow to cool completely. Drain the cooled beetroot and mix with the yogurt in a bowl. Stir in the wasabi paste and lemon juice. Season. 5. Preheat the barbecue or a griddle pan. Cook the burgers according to pack instructions. Lightly butter the burger buns and place cut-side down onto the barbecue or griddle for 1-2 minutes or until lightly toasted. 6. 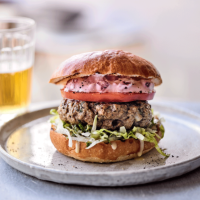 To serve, place a tablespoon of the bagna cauda on the bottom half of each burger bun. Add the lettuce and mint. Place the lamb burger on top, add the tomato slices, followed by the beetroot relish and top with the rest of the bun.